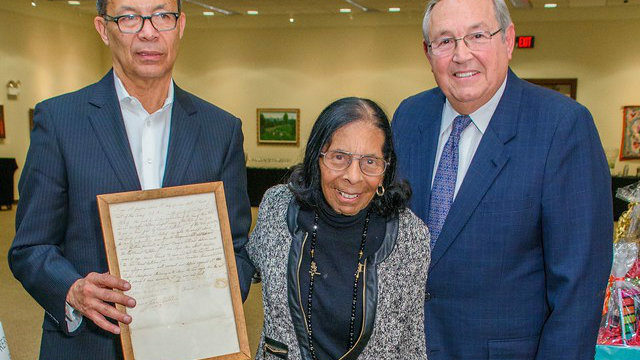 Long known as the First Lady of the Charles H. Wright Museum of African American History in Detroit, Michigan, Dr. Roberta Hughes Wright passed away on April 2, 2019. Throughout her life, Dr. Wright consistently maintained a gentle but focused steadfastness and had a compassionate demeanor. The widow of the founder of Detroit’s Charles H. Wright Museum of African American History, Dr. Roberta Hughes Wright was born in Detroit, Michigan on April 17, 1922. Her father was a founding physician at one of Detroit’s first all-black hospitals, Dunbar Hospital, founded in 1918. Dr. Wright earned a Bachelor of Science, Master of Education, and Juris Doctor degrees from Wayne State University, and a PhD in behavior sciences in education from the University of Michigan. Professionally, she was an educator, social worker, higher education administrator, and attorney. By avocation, she was a history enthusiast. She had a deep appreciation for genealogy and black historic preservation. She and Dr. Charles Wright helped to preserve black heritage at South Carolina’s Penn Center. As a widow from a previous marriage, Dr. Roberta Wright married fellow widower Dr. Charles Howard Wright in 1989, founder of Detroit’s Charles H. Wright Museum of African American History. Dr. Roberta Wright became heavily involved in museum work, including attending Association of African American Museums conferences, and serving on various committees of the museum, and helped to change the name of the Museum of African American History to the Charles H. Wright Museum of African American History in 1998. Dr. Roberta Wright was a beloved presence around the Wright Museum throughout the years. A renaissance woman, Dr. Wright authored several books, including The Wright Man: A Biography of Charles H. Wright, M.D. (1999) and The Death Care Industry: African American Cemeteries and Funeral Homes (2007). Bringing social graces to civic causes was a part of Dr. Roberta Wright’s special aura. She was a charter member of the Great Lakes (MI) Chapter of The Links, Incorporated, and was an active member of Alpha Kappa Alpha Sorority, Incorporated for over 75 years. She amassed numerous awards for all the ways she touched the lives of others. It was a joy to witness the way she interacted with and motivated young people especially. Those of us privileged to spend time with Dr. Wright knew we were in the presence of someone special when we were around her. With gentle and gracious tones, she spoke volumes with her works. I was always inspired by Dr. Wright’s clear sense of purpose, action, independence, and awareness of the details. It was as if Dr. Wright could do anything. Well into her 90s, she continued to drive herself around Detroit, living life vivaciously. Wright Museum President/CEO Juanita Moore ensured that we always had a parking spot reserved for Dr. Roberta Wright’s delightful visits to the museum, an institution she and her family genuinely loved. Dr. Roberta Wright’s generous and beautiful life will always inspire us to, just as she did, embrace and maximize our black brilliance to the fullest. May her lovely soul now take rest.